Hey ho buccos! 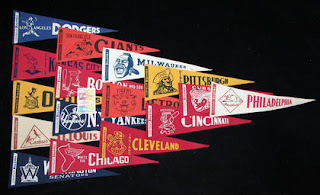 A little bit of serendipity has occurred between my last post and now that makes today's discussion of the 1959 Topps premium baseball pennants more widespread than planned. 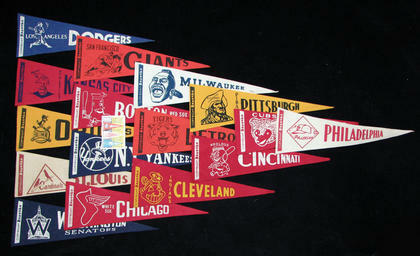 The first bit of good news is that Friend o'the Archive Doug Goodman sent along scans of each of the 16 pennants. 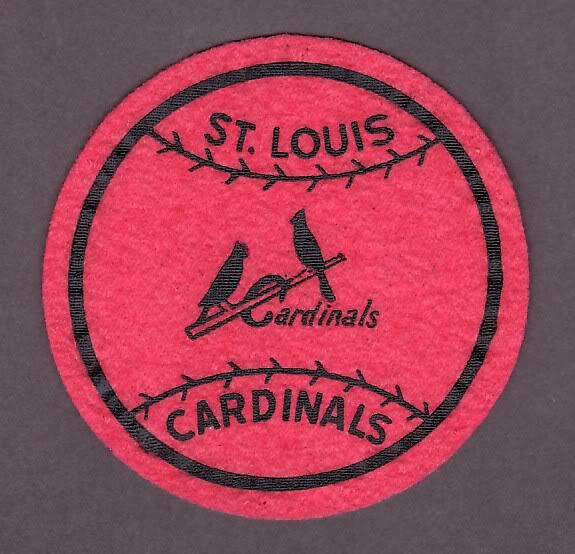 He also sent along all but one of the 1958 Felt Emblems as well so there will be a catch up thread on those soon. 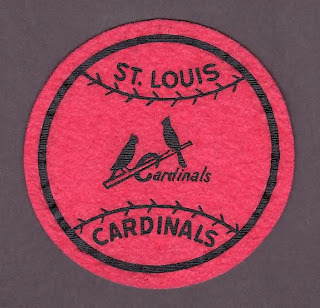 If anyone has a scan on the 1958 Cardinals emblem, please send it along as I can do a full visual checklist once it is in hand. 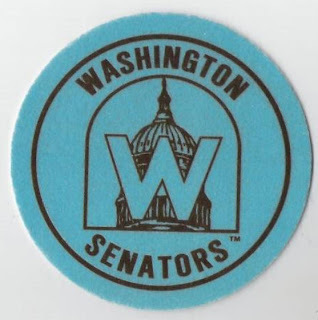 I had to nick that from Jon's Fleer Sticker blog by the way. That tear to the left of the Orioles pennant seems somewhat common; I have seen other examples with similar damage in or near that spot. Paper inserts unfortunately were not designed for a long life! These are often called Bazooka Joe emblems as they were advertised as premiums on Bazooka comics. While these are considered to be from '56, dates around that are also possible. 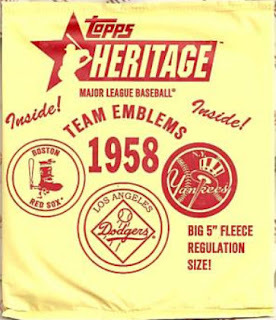 It may be easier to think of them as pre-1958 MLB West Coast expansion era premiums. A lot of the 2007 versions show up on Ebay, so watch out. I had to lift that from the Old Cardboard website (sorry Lyman and Brett!). Both versions of the original felt (fleece?) 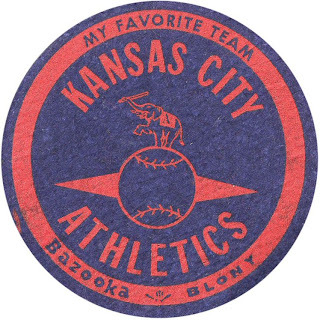 emblems are about five inches in diameter. Only two colors are used on these as well one of which is sometimes white. 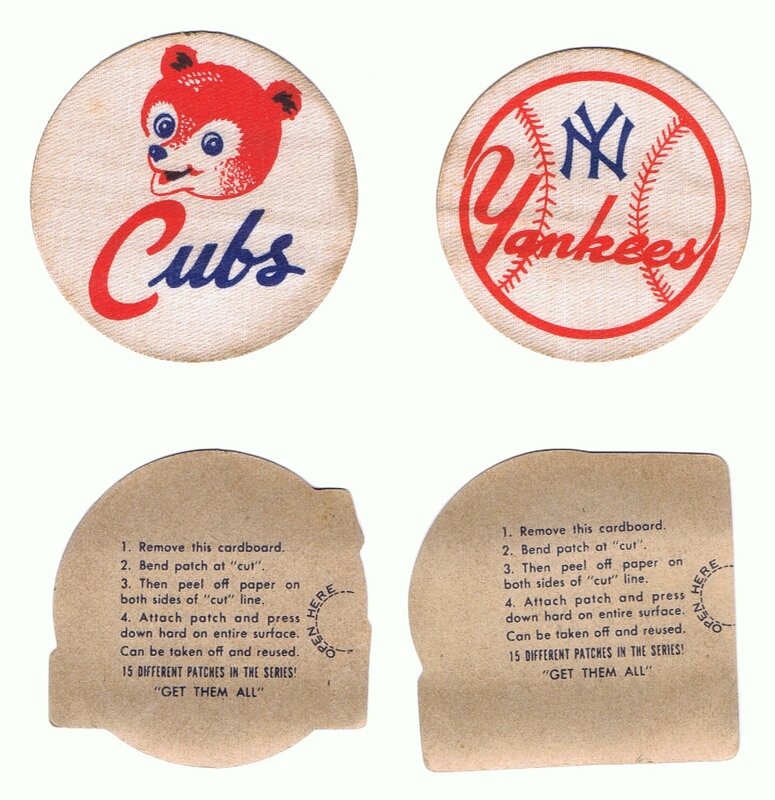 Sixteen teams were issued each year; I would love to find some scans of the Brooklyn Dodgers and New York Giants from '56 but these do not pop up all that often. The year of issue is usually ascribed to 1958 but like the earlier version, they may have spanned a couple more seasons. Any additional details on the cereal box inserts or Topps emblems would be appreciated. 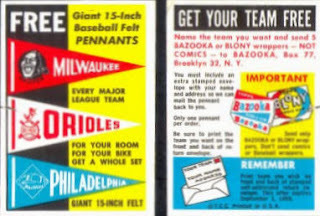 I'll be taking a look at the larger Topps and Bazooka pennant premiums next time out, which are wider ranging by far than the circular emblems. 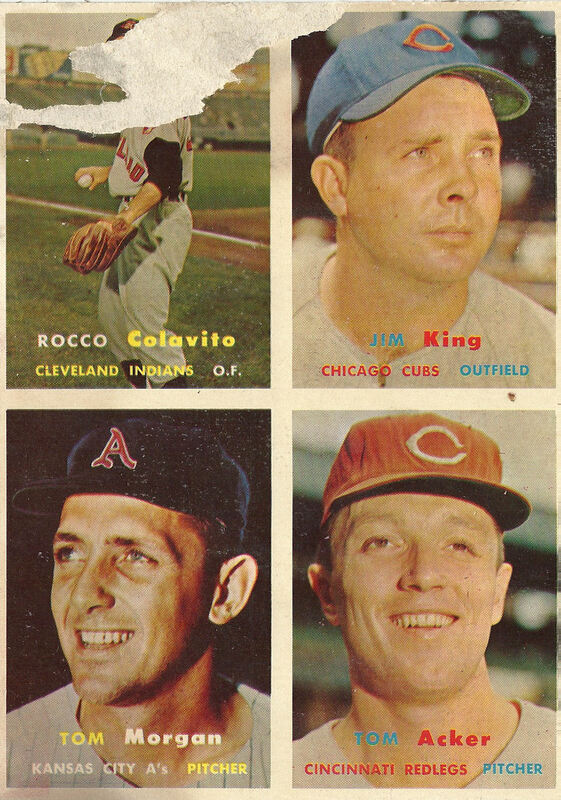 Back at it today kiddies, as we finish our look at Topps Salesman's Samples (for now) before your webmaster takes off for some R and R.
No corresponding back scan yet but as advised previously, I'll do a catch up thread with all the missing samples at some point. Not only do the 61's look great, they celebrate the year of you blogmaster's birth! The immortal Stan Williams gets card back honors for some reason. The reverse gets a little colorful and shows an Embossed insert. I can't make out who it is but then again, you can;t make out who's who on the insert either! 1966 would be the start of the Duryea era. Koufax and Mossi are really the yin and yang of 60's pitchers, aren't they? Topps ended the traditional salesman's sample strips in 1967 but I don't have scans yet, sorry! Once again thanks to Anthony Nex for the scans; any technical difficulties are of my own doing not his. Off to Florida for some sun and surf - see you all in a couple of weeks! 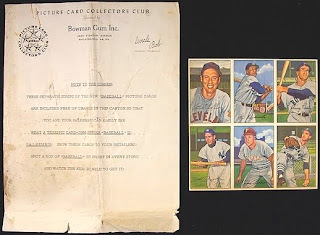 Just a little detour before we get to the 60's Topps Salesman's Samples as intrepid reader Brad sent along a couple of righteous scans regarding Bowman's sales tools prior to 1954. The layout suggests a 36 card sheet arrayed 9 x 4 and I believe that is how Bowman printed these almost square cards, although as part of a larger sheet. 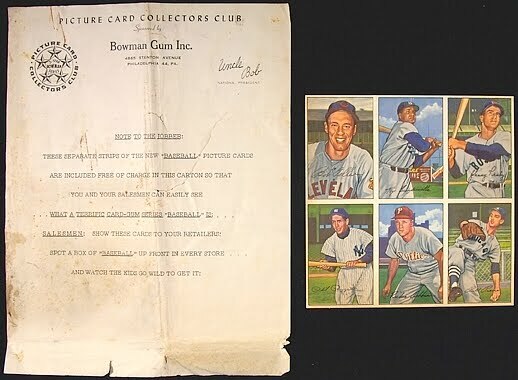 The letter has added the "Uncle Bob" tagline and includes the famous 5 star Bowman logo-nice! Uncle Bob was their Berry Crocker but he looked like Fred Mertz and made some appearances in a Bowman Collectors Newsletter that, while ahead of its time, was quite, shall we say, whitebread. I'll round a few newsletter scans up one of these days. I am aware of two issues but the 1952 connection is a couple of years past when I thought they issued the publication so they may have based an ad campaign around ol' Bob. Not a bad selection-four hall-of-famers and two others who were pretty close. Once again Bowman used a 9x4 array for 36 card sheets (perhaps as many as three of the 36 card sheets would have been on a larger master sheet). We can surmise there were similar sales tactics used in 1951 and surely in 1953 as well. 1948 and '49? We'll see what turns up. 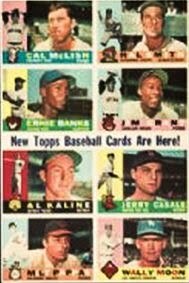 Since Bowman is officially part of Topps, the blog, as I opined recently, will reflect this going forward and we'll look at uncut Bowman sheets in more detail someday. We will be digging back to Gum, Inc. as well then and maybe some pre-war uncut sheets will turn up but next time out the 60's Topps Salesman's Samples will be discussed. Last time out (yesterday, actually) we explored the world of Bowman's salesman's sample strips and promised a peek at Topps own strip show. Well we're off! 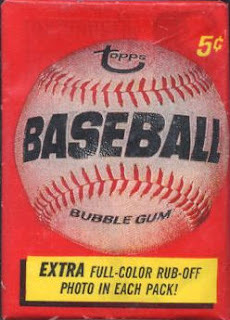 Those are numbered: #41, 42 and 43 which fits the known pattern of how Topps consecutively printed the 52's, row by row. 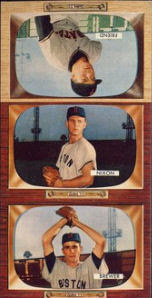 The back touts the Giant Size theme that was starting "Taps" for Bowman. Boy a box of those would be sweet! The '53 strip adorning the header of this blog is not a sample, merely a remnant. No scan as of yet (I will do a catch up thread when I get ahold of scans for all the missing years). More of a mashup now as left to right we have #'s 24, 45 and 33. The back is getting to look like the "classic" samples, which have one facsimile back and some advertising but this one is transitional. Check out the truncated reverse of the middle card and note the flip flop, which is odd given that doubled rows of similar colors were how the 54's were arrayed. By the way, the backs on the samples often did not match the card fronts. Sometimes a random back was used repeatedly. I guess calling the DH's a gimmick seemed like a good idea at the time! 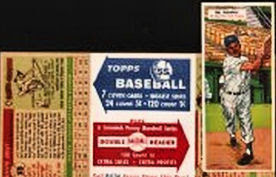 It seems like there is no hope of ever finding a 5 cent Doubleheaders pack; they appear to be solely a penny item to be sold alongside the regular issue. That is the "classic" look I referred to earlier. I can't quite make out the middle part as the scan is blurry but the middle would be used to good effect shortly. That is the address of a grocery wholesale in Chicago added to the mix in the middle. I suspect Topps started personalizing samples for their wholesalers to hand out as order reminders while having their own samples going to the wholesaler (or jobber if my understanding of the nomenclature is correct). 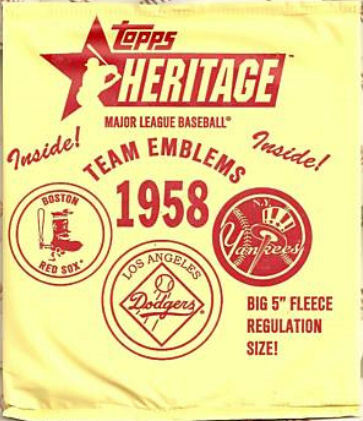 I think the 1959 sample is really sharp and like how the card back is so green. The premium offer reference is just icing on the cake. Look for a look at the 1960's samples next time. Thanks to Anthony Nex (again) and Don Johnson (1959 collector supreme) for all the great scans! I have been playing around with ideas to expand the scope of the blog a little bit; nothing crazy just a little bit of contextual history here and a look at TCG's forebears there. 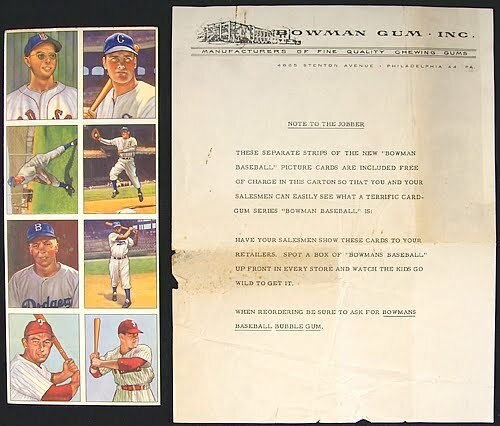 The easiest way to feed this urge right now is to add a little more Bowman to the mix, which will in turn lead back to Gum, Inc. right at the start of FDR's administration. I have been looking at three card strips of cards and salesman's samples of late and have discovered a couple of neat Bowman items out there, courtesy of Anthony Nex, who graciously let me lift about a bazillion scans. I don't know the significance of the blonde version being upside down but it must have been cobbled together really quickly. They couldn't have printed both together, could they? 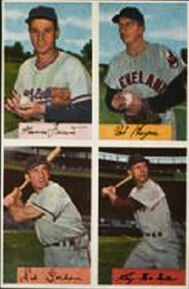 Back soon with a look at Topps saleman's samples from the 1950's. Stay cool kids! This might be the first time I have posted twice in a single day but with a 3 1/2 day weekend upon us and Mrs. Archives still being at work, I have a little extra time on my hands. We are due for about four straight days of glorious weather to celebrate the Fourth of July, so I figure I'll post 'em if I got 'em! 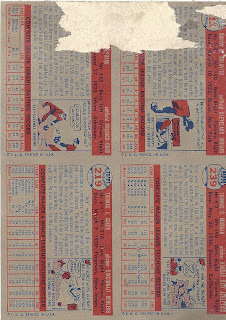 As you no doubt will have noted by now, the header for this blog is a 4 card strip of uncut 1953 Topps baseball cards, which came from a significant find of uncut strips that had been discarded as printer's scrap but somehow spared the rubbish bin in 1953, only to resurface 30 years later as an old print shop's storage room was being cleared out. I snagged the strip you see above once it hit the shelves around 1983 at Bob Sevchuk's old shop in Hicksville, NY which also served as the walk-in surgical theater for the infamous "Gretzky" PSA 8 T206 Honus Wagner card. Over the years I have accumulated a few other strips and am on the lookout for more and thought it would be fun to show some. The card that would have been to the right of #79 Wyrostek (or left of him if looking at the obverse) was none other than Mickey Mantle. 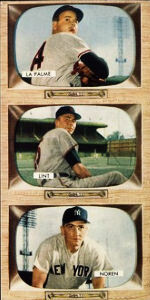 I believe the Mantle ended up on a two card panel with Jim Hegan to his obverse left but can't swear to it. The Hegan card was on the upper left corner border of the uncut half sheet though. 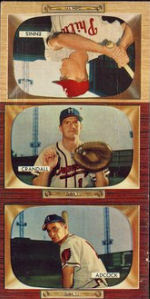 Next up is a hand-trimmed 6 card panel from 1972. Hand trimmed strips and panels do not seem to be as common as factory or machine cut ones. I'll finish up with a 1972/73 hockey strip, also with an unfinished back. It had some print issues which I have corrected with my photo editor so caveat emptor! 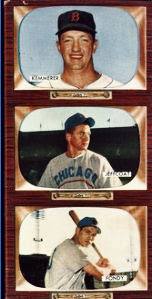 The 3 card format is very pleasing to the eye but since Topps worked in a universe of 11 card rows, I am not certain why they are so common. Even their salesman samples (stay tuned) were generally 3 card strips, albeit with promotional information on the reverses and I suspect primarily from the first series of cards issued each year. 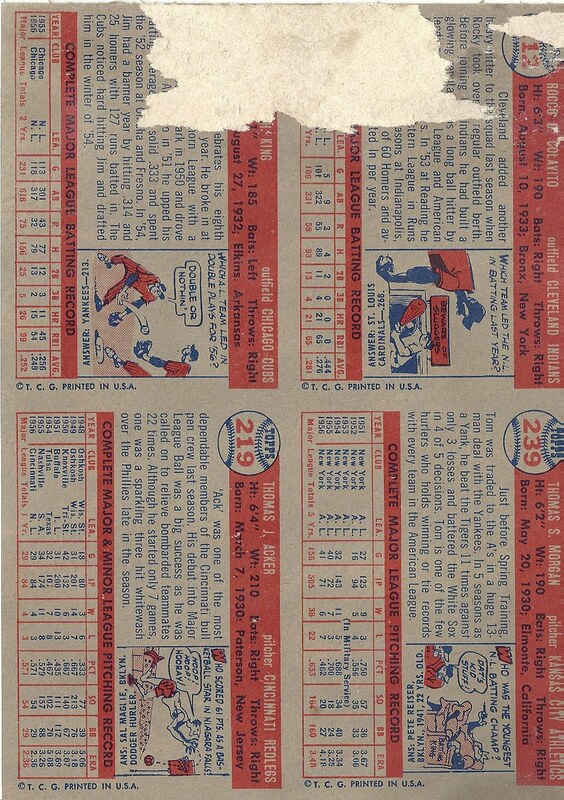 Were the majority of 3 card strips created by Topps for some reason or do they represent pieces of uncut sheets that were sliced and diced after the fact? What happened to the 2 card panels that would have been left over as orphans from each row? We'll attempt to find out but right now I have to go make some hamburgers!